I've just started creating a new (from an existing mips/pic32mz configuration) cpu and board port for this dev board. So far only a few I/O items are working like the debug uart, user leds and rgb led but it boots, runs the 'hello world' and timer serial port examples and the Linux based bare-metal MIPS-MTI compiler/linker creates a mplabx-ipe compatible hex file for flashing. Update the Linux shell path (in .bashrc) to include the correct compiler after the tools install. The LEDs, switch, usb power, uart and spi (found a good starting example on the net) drivers are running on the hardware so it's possible now to communicate with radio modules and other serial devices once testing is done. Still creating a board file with all the pin and device connections but most of the simple communications signals to the Mikro Bus headers are done. 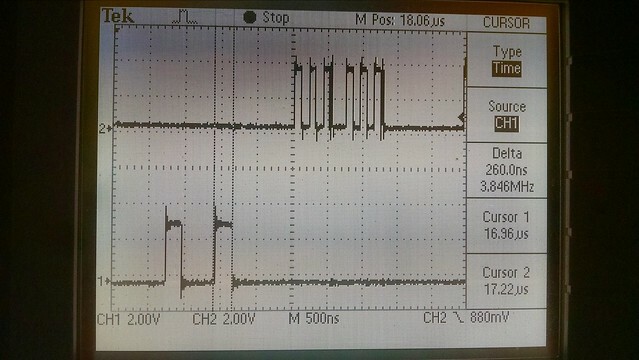 SPI MOSI data with SCK clock on the top and two UART serial ports (and one debug serial port) on the bottom running the driver test program. 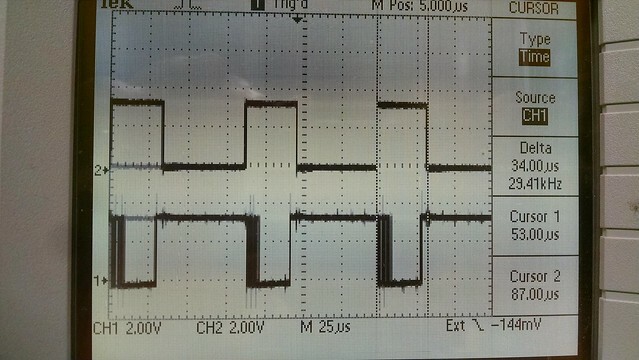 Serial data from uart4 out -> uart2 in -> spi2 out as a 4 byte sequence for every uart byte received. 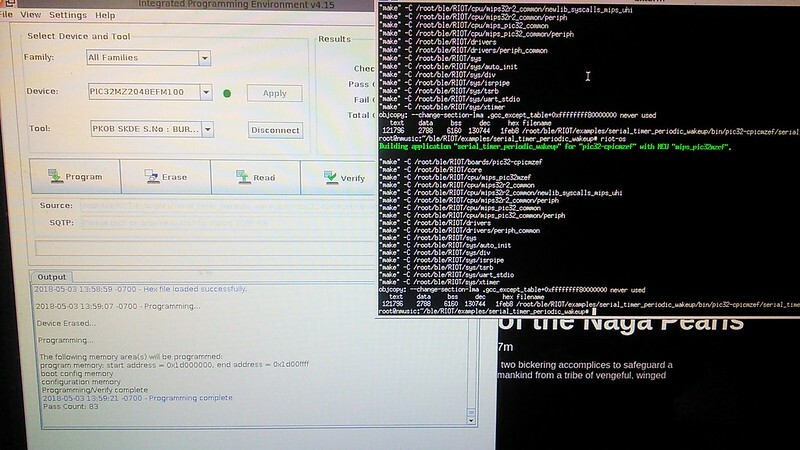 RIOT-OS application testing code for this board after being compiled and flashed on a Linux workstation using the baremetal MIPS compiler with MPLABX-IPE to program the hex file result. 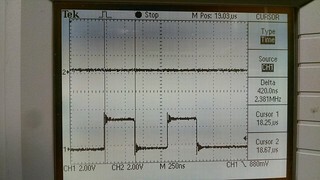 Porting issues: Not many but interrupts are a slight issue to I/O speed. 1. Interrupts. The MIPS compiler can only handle Single Vector Mode EIC (like legacy 8 bit pics) so all interrupt flags must be checked in sequence adding latency during long interrupt low priority sequences. 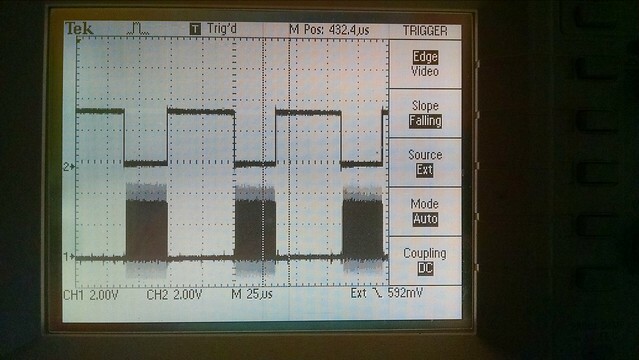 To use MULTI-VECTOR MODE with hand written code is an accident waiting to happen so I think I can use the Microchip xc32 compiler to generate the correct , register setting, Computed Offset, Variable Offset, interrupt prologue, shadow register set and an epilogue for each device in a riot-os module if I see a real problem. 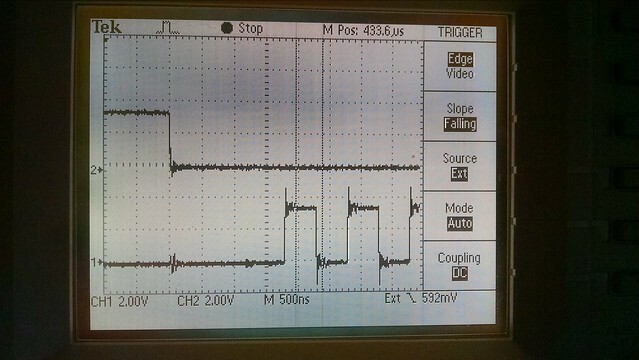 In my test example (to look for interrupt based problems) I'm using a SPI write in the uart receive context. 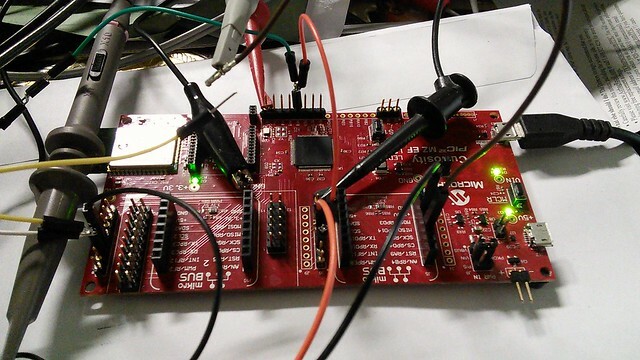 All uarts have 8 byte deep separate tx and tx FIFO buffers in hardware. * vector 0 which is equivalent to 'sw0' in 'VI' mode. * may be better anyway. 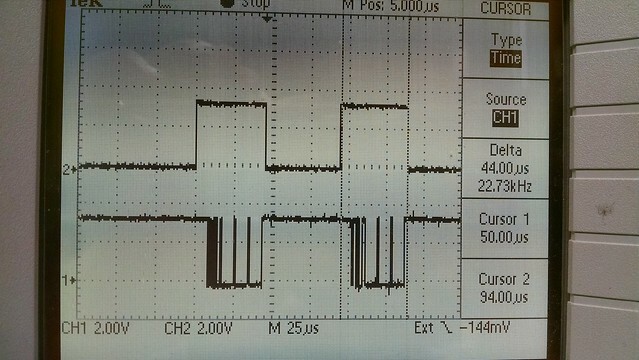 uart tx write processing time on top, bottom trace driver processing time for spi1 clocks started from that byte of data. 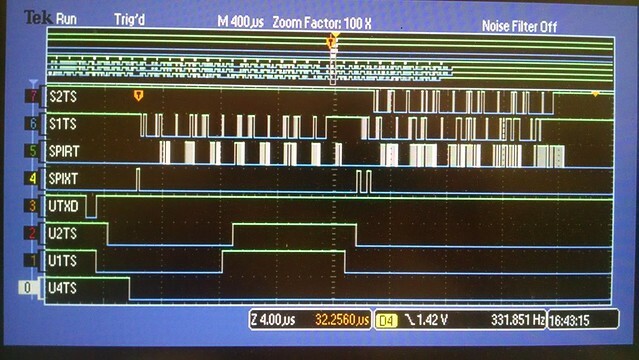 The top trace is the rx_irq latency (time between toggles) between uart interrupts, bottom trace driver processing time for spi1 clocks started from those interrupts, top rising debug edge to spi clock edge(depends on the SPI mode). 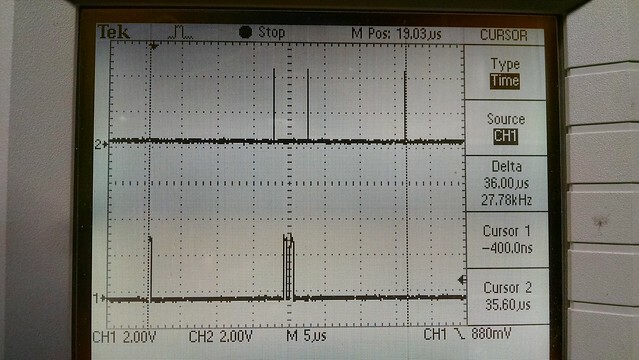 Here I'm sending both uarts (1,2) the exact same signal from uart 4 so the time between toggles tell me how long the processor takes to handle both. 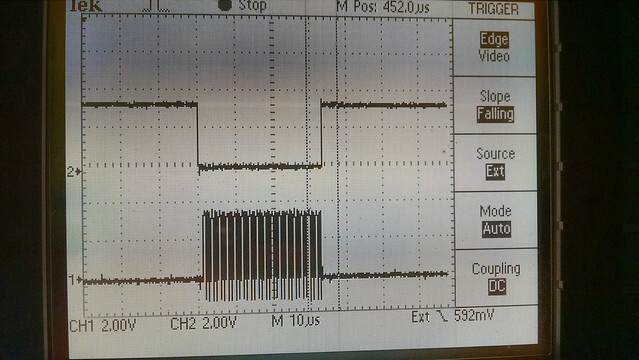 Because the SPI write is in the interrupt context any pending device interrupt flags must wait until the transfer is done as shown above in the toggle after spi write finishes and the uart ISR returns to the vector. With multi-vector the higher priority interrupt would preempt the current interrupt, process the pending flag and return to spi processing when done. 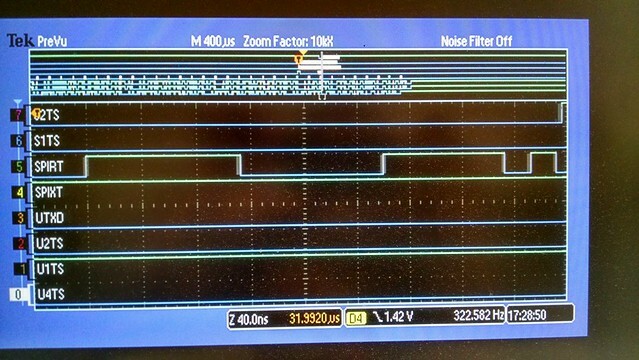 You normally wouldn't spend too much time in a typical interrupt so the effect on most real-world RTOS I/O is small outside of testing worst-case examples looking for corner-case bugs. 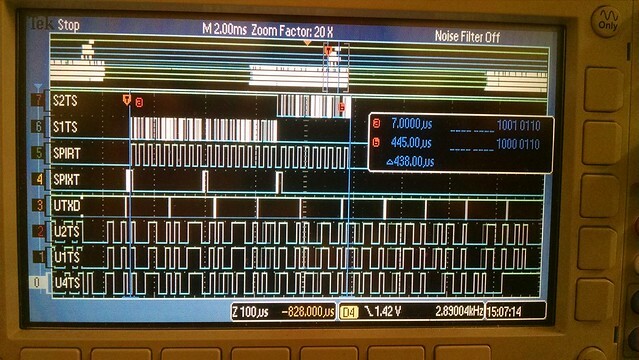 Another issue to examine is processor memory speed in a 32-bit controller with cache and a 200MHz ref clock/sysclock. Using L-1 cache properly is vital to system speed. 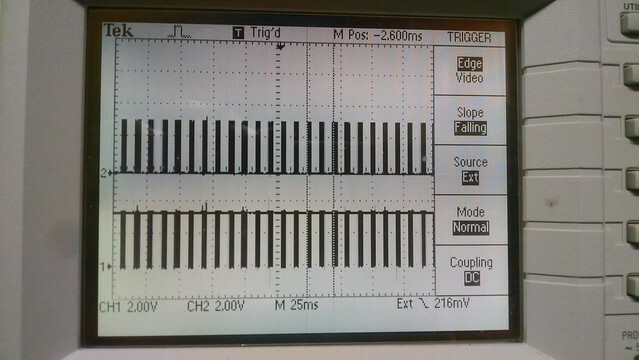 The test program uses a cpu/memory bound busy loop for a time delay. If the system is set for NOCACHE this is the resulting delay. Enable cache using the non-coherent, write-back, write allocate mode. 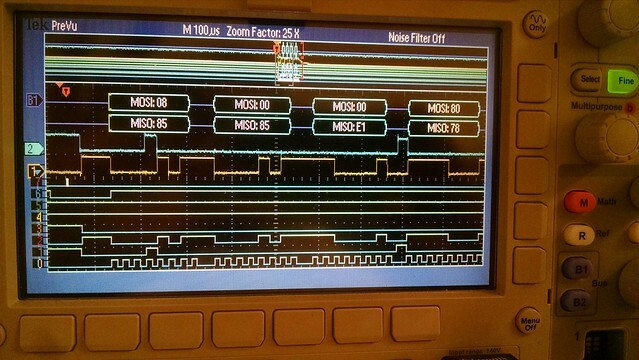 busy loops for precise timing on a pic32 with cache enabled. RIOT-OS cache control function code for the pic32mzef. Explains the usage of the cpu configuration registers. Looks like I may need to expand the RIOT-OS spi API to include ASYNC transfer modes. The current API makes it very hard to use the chips 16 deep FIFO because there it's no provision for receiver callbacks, only waits for a received data after the transmit. I've modified the SPI driver to detect NULL receive buffers for sending data to things a DAC using the transmit FIFO only but it should be possible to have a general ASYNC mode driver at the core of regular send/receive transfers. 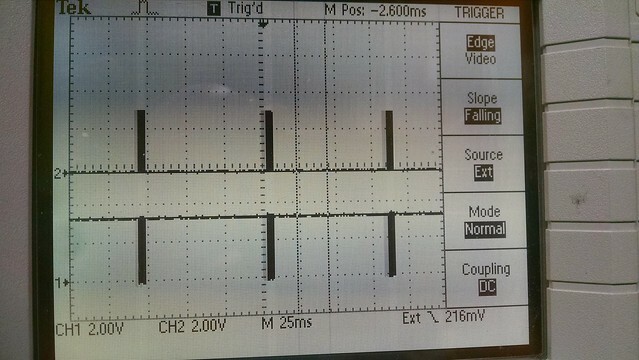 S1TS and S2TS are the spi transmit outputs without FIFO support. 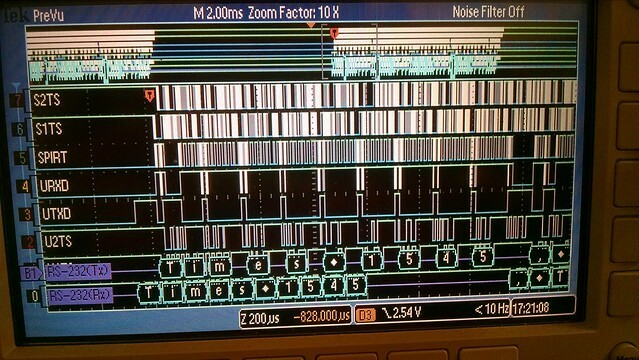 SPIRT show the toggles for each spi receive transaction in response to each UART byte receive interrupt duration shown by URXD. 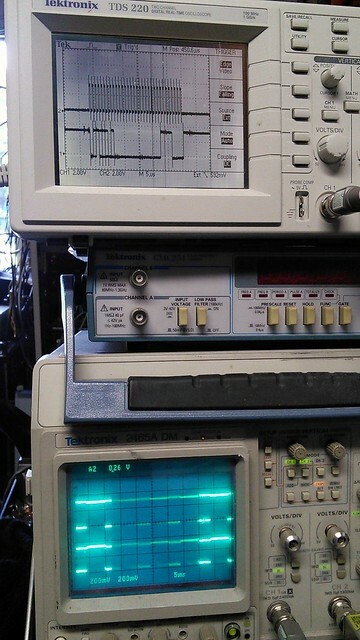 Everything looks nice, synchronous and slow. unless we use a receiver interrupt callback like the uart driver does. The Linux SPI system is much too complex (I've written drivers for it) for this simple rtos but a spi_async driver (with synchronous wrappers) should be possible without too much trouble. 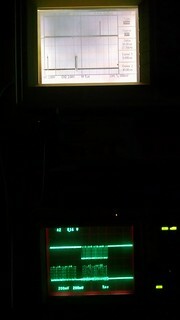 Got the first version of the async SPI engine running for the radio module on the board. 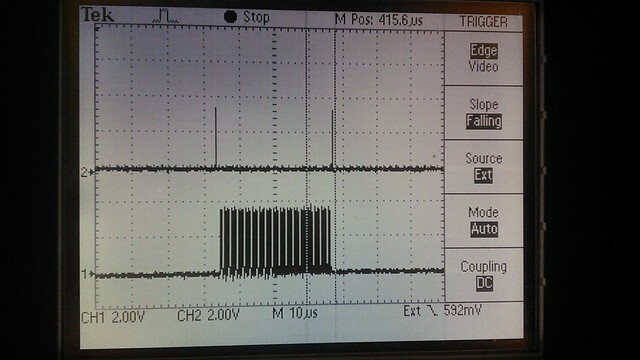 SPI receive ISR processing time per byte interrupt from the fifo buffer, first edge to last edge, minus about 10 ns per toggle for debug pin operations. The cpu driven SPI tx/rx works pretty well up to about a 1MHz clock but at higher transfers rates even the pic32mzef starts to slow down. So the final part of the driver is the DMA engine. 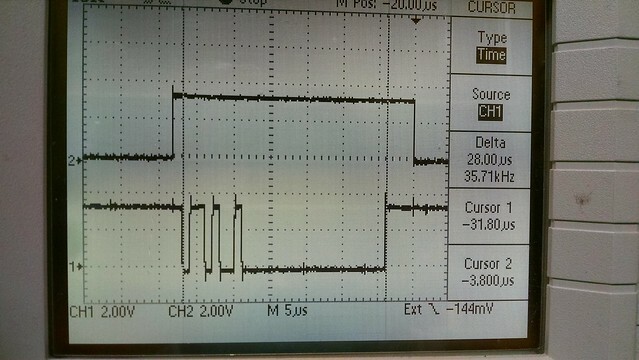 Here we've only enabled transmit DMA to make a cpu usage tx/rx comparison using a 10MHz sck with three 18 byte blocks on spi 1&2. 1. Cpu usage (SPIXT) during data transmit. 2. Cpu usage (SPIRT) during receive. 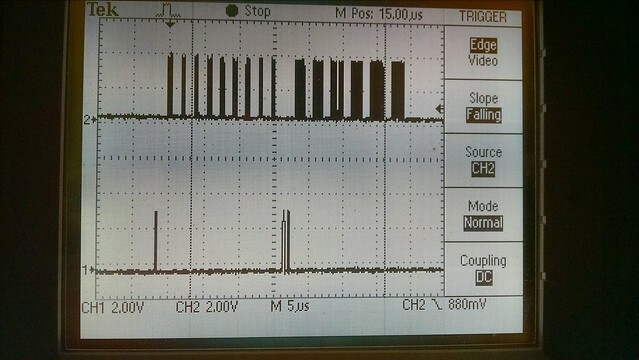 when both spi channels are transmitting. 1. 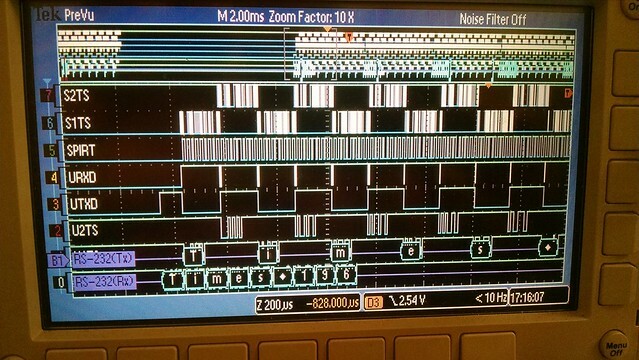 Cpu time (260ns per block) to transmit 2 18 complete byte blocks on spi channels 1&2. 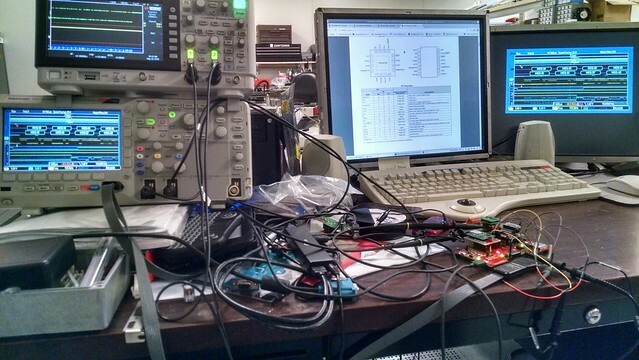 The DMA controller is moving the data from the output buffer uncached memory to the SPIxBUF register in background. 2. 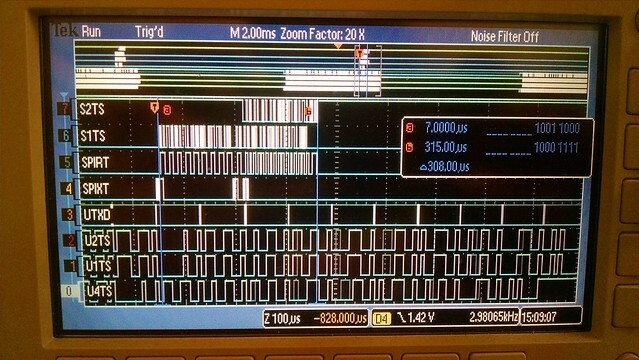 Cpu time to receive 2 bytes each of the transmitted blocks on spi channels 1&2. With L1 cache it's required to use uncached memory in kseg1 to keep data coherent with program memory in kseg0. You can use static allocation with variables then assign a pointer or malloc coherent memory for DMA. * physical address and back. Testing program and driver fragments. These source and destination address then must be converted to physical addresses for the actual DMA engine. Once the receive DMA is enabled we're ready to fly. 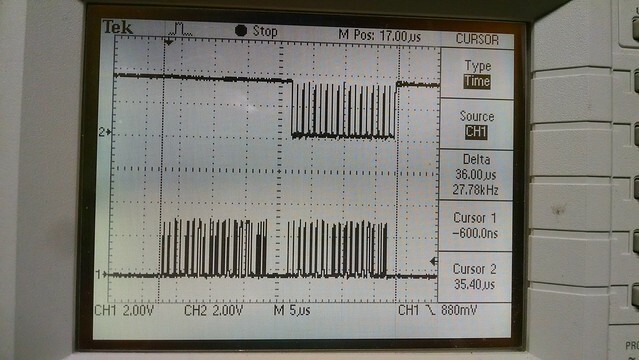 Full DMA (four channels) send and receive on spi channels 1 and 2. 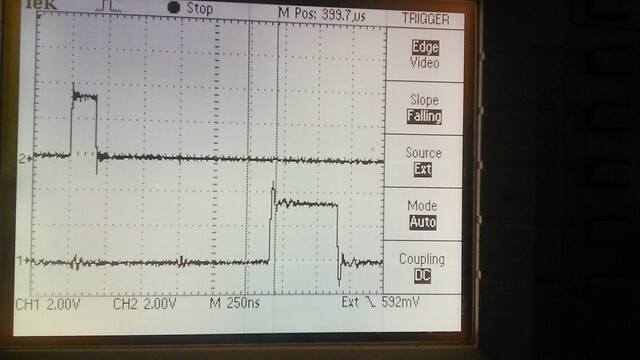 Nanoseconds of cpu time to transmit and receive the three 18 byte test streams a 10MHz. 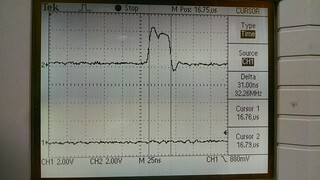 SPI ports 1 and 2 data. 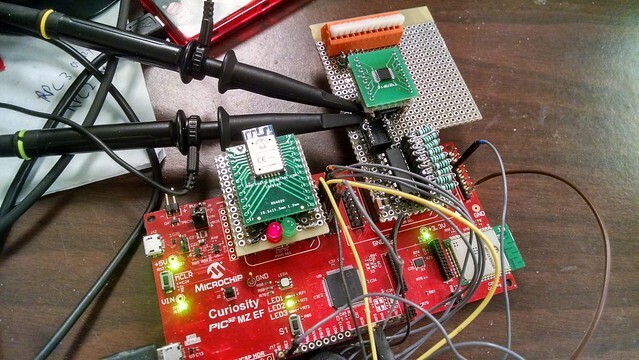 The code works and is a fair example of close to bare-metal MIPS32 programming on the RIOT-OS but it is specific to this board configuration. Some effort could be expended to generalize the setup and data using address macros and structure for others processors and board configurations but what fun is that when I could have done the exact same thing using MPLAPX, xc32 and Harmony in less than a hour using just about any PIC32 processor without a rtos. Things seem to be working well so far. 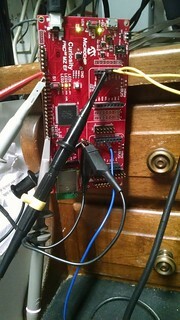 Starting a port of a pic24 BLE application that talks to a Android app to the OS port using one of the mikro BUS socket for a RN4020 BLE2 click board. Need to finish a rewrite of the original PIC24 UART routines to be compatible with RIOT-OS for complete transfers of of board data but it pairs and displays the basic device characteristic information. Still coding up the OS port with general hardware timers and interrupt hardware handlers and rewriting the BLE application to use more riot-os general services. This has the expected side-effect of deoptimizing the application to a specific processor but generalizing the hardware interface for use on a generic riot-os based machine. 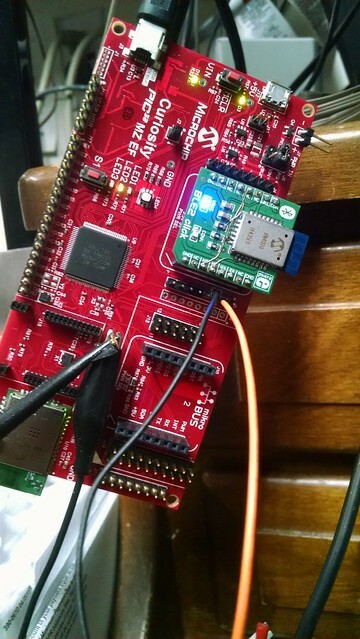 driver development with a RN4020 BLE modules on another vector board socket. is made for the 24-bit adc. 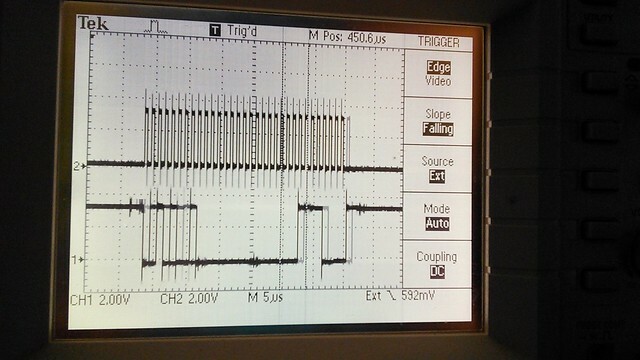 SPI signals (logic and analog traces) to the ADS1220 @2MHz clock with 47ohm spi damping resistors in series with the CPU MOSI/MISO lines on the vector board.